A team of planetary scientists have revealed in a newly published article in the journal Nature that an already unusual object has just become even more curious. The object, designated as '288P (300163)' was origianally discovered by the UA's Spacewatch program in 2006 and believed at that time to be a rather mundane Main Belt asteroid, one of millions of such asteroids orbiting within a belt of space rocks between the orbits of Mars and Jupiter. However, in 2011 it was observed to have a comet-like outburst of dust and gas and was thus classified among as a rare class of objects known as Main Belt comets. In the most recent twist to the story, 288P (300163) is now confirmed to be a binary asteroid, with the two asteroids orbiting one another at a distance of about 100 kilometers. This is the first known binary asteroid also classified as a comet. 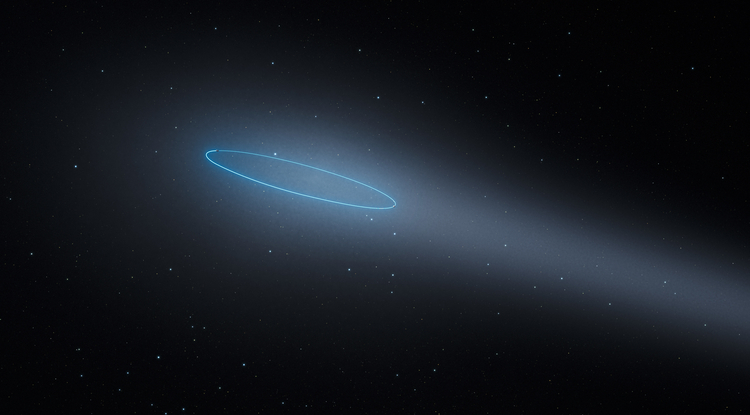 Researcher Stephen Larson of the University of Arizona's Lunar and Planetary Lab, and a co-author on the new paper indicates that his team of researchers have been been observing 288P (300163) with the Hubble Space Telescope for several years now, trying to understand how the object is producing comet-like outbursts. No doubt this object will receive further attention as researchers try to understand how this object developed and what clues it may provide about the structure and evolution of the solar system.